Gaming can be essential part of life for avid gamers, but sometimes some may experience that PC Game runs slowly or gives a lag even if system requirements are met. In this case, gamers might want to upgrade hardware to improve gaming performance, tweak the system settings, and so on. Now users can play games lag free, enjoy fast game launching and response with the help of Game Booster Premium 2. IObit Game Booster Premium is a utility tool for Windows that is designed to optimize PC and defragment game directories for better gaming experience. Game Booster Premium 2 combines an array of new features that can automatically detect and temporarily stopping background processes, unnecessary Windows services, and cleaning files from RAM. The new Game Booster also can updating hardware drivers, downloading essential gaming tools, tweaking system settings for gaming, and intensifying processor performance. 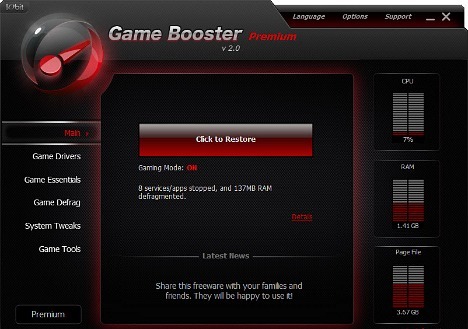 IObit Game Booster Premium 2 normally price $19.95 for single license. 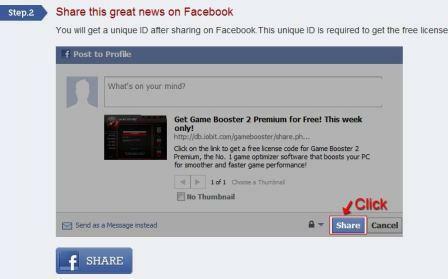 As part of celebrate the release of Game Booster Premium 2, Iobit is now giving away full version of Game Booster 2 premium version from 21 Feb to 27 Feb 2011 to its Facebook fans. To grab a free full version license of IObit Game Booster Premium 2, just visit the URL hosted on iobit.com. Click on the big Share button under step 2. There is no need to like the IOBit Facebook page or actually share the story on your wall. Just click Cancel button on the Facebook pop-up. You will still get the unique ID to claim the free IObit Game Booster Premium 2 serial number. Visit another page on iobit.com to enter the unique ID (within 10 minutes and get the free license key code. Install IObit Game Booster Premium 2, and enter the license key received to enjoy the program. IObit Game Booster Premium 2 compatible with Microsoft Windows XP, Vista, 2000 and Windows 7 operating systems.